For the greater good: A devastated area of forest used for cattle in Alta Floresta, Brazil. The country plans to reduce deforestation next year by 20%, to less than 4,000 sq. miles (around 10 360 sq. Rio De Janeiro: The government of president Luiz Inacio Lula da Silva introduced ambitious targets for reducing deforestation and carbon dioxide emissions in a nation that is one of the world's top emitters of this heat-trapping gas. The plan promises to make Brazil a more influential player in global climate change discussions. 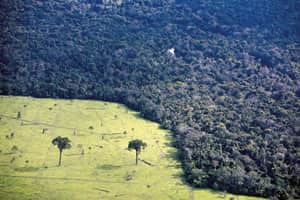 It could also encourage more pledges from wealthy countries seeking to essentially pay Brazil to preserve the forest for the good of all humanity. To achieve the first phase of planned cuts, Brazil would have to reduce deforestation next year by 20%, to less than 4,000 sq. miles (around 10 360 sq. km). That would be the lowest amount per year ever recorded in Brazil, said Paulo Adario, the Amazon campaign director for Greenpeace in Brazil. Brazil's economy is centred on the export of agricultural products and has driven much of the deforestation in the Amazon. “Brazil was always on the defensive when it came to the question of climate change," said Carlos Minc, Brazil’s environment minister. “And now it has completely changed, passing a bolder plan than India and China." Minc said the plan would help meet a demand of some of the more developed countries, including the US, which has said it would not agree to firm emissions targets until less-developed countries that produce significant amounts of greenhouse gases do the same. Deforestation produces more than one-fifth of human-generated carbon dioxide by some estimates. Some 75% of Brazil’s carbon emissions come from deforestation, Minc said. Brazil's plan would slice those emissions sharply, preventing some 4.8 billion tonnes of carbon dioxide from being emitted by 2018. Some environmentalists contend that deals involving compensation for forest protection could weaken climate agreements in many ways. They also say the plan leaves the most difficult targets to the government that will follow da Silva’s. His term ends in 2010. Still it is viewed by some scientists and climate experts as major step forward.